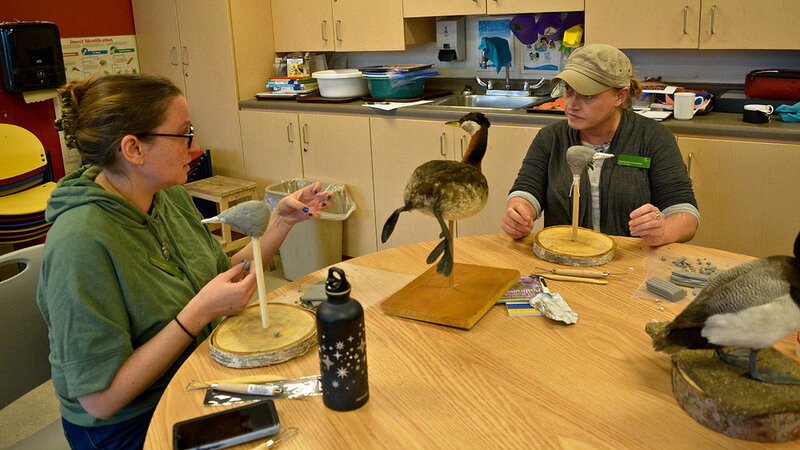 Thank you to everyone who participated in the Bird Sculpting Workshop at Toronto Botanical Garden. The majority of the attendees had never worked with clay before, but as you can see in the photos below, they did a superb job! What’s not apparent in the pictures are their sore fingers which came from kneading rock hard clay for hours. This was not intended on my part. As it turned out, the clay which I bought a week earlier was not behaving as expected; think of times you’ve bought a loaf of bread from the bakery expecting it to be soft & chewy, only to discover afterwards that it’s stale & crumbly. Our brand new clay was the latter. I’ve never encountered this problem before, but a Google search confirmed that this was not an isolated incident. It seems that the lubricant which keeps the clay pliable had leeched out; telltale stains on the box seem to support this theory. Perhaps the clay sat in a sweltering truck as it made the journey from the United States to Canada, or possibly it was a production problem. Continuing to work with this unforgiving clay was far from ideal, but to my great relief, the solution was to rub mineral oil directly onto the dried out clay. It had the effect of renewing it in the same manner as how a moisturizer softens dry skin. With the mineral oil working its magic, the second day of the workshop was considerably more pleasant for the sculptors and it meant they could focus on artistry instead of their wincing joint pain. I think everyone should be very proud of their bird portrait studies, I am truly impressed. Once again, I apologize for the clay debacle and want to thank everyone for their understanding and not throwing those bricks of rock hard clay at my head! I’m going to start a conversation with the Manufacturer and share this experience with them. While this clay is more firm than other brands, it should not have required that amount of elbow grease to manipulate; I have a box of two year old clay that’s still pliable and easy to use. Thanks to all the staff at Toronto Botanical Garden for helping prepare for this workshop, especially Maggie Janik and her father for supplying the beautiful Wooden Stands for the artists to use and take home with them. Special thanks to Mark Peck from the Royal Ontario Museum for loaning us a fantastic selection of mounted birds.